A few weeks ago, in what can only be deemed a bit of a scoop, I was contacted by a representative from America’s fastest growing craft spirit brand, Tito’s Handmade Vodka. They had heard of Denmark as a nation with a growing interest for gastronomy and cocktail culture. Would I, they wanted to know, be interested in sampling their product and offering a few thoughts and feedback? These sort of requests, humbling as they are, are always a cause of consideration for me; does the product fit into the scope of my blog? Would I have found the product interesting enough to purchase and write about had I not been offered a taste? Am I really entirely impartial when I’m actively approached about doing reviews? This time, after some consideration and research, I said yes. I said yes not only because I liked Tito’s style and thought they had an interesting product, but also because I felt that the good people at Tito’s had something that many other premium spirit brands lack: personality and spirit! (no pun intended) And before we get into the review, allow me to explain what I mean by that. As the market for (premium) spirits continues to grow, a couple of factors have become increasingly important: one is brand, the other is storytelling. Storytelling specifically has become all the rage in the spirit industry as brands spin up elaborate stories around their products featuring legends about everything from mythical sea creatures over dangerous highwaymen, famed crooners and even 17th century Jamaican governors with a taste for piracy. And that’s all well and good, but it does make for some overly fantastic, obviously fabricated stories and in some cases even difficulty in discerning fact from fiction. In the case of Tito’s Handmade Vodka, they do things a little differently than most, though. While they do have a brand, obviously, it’s not much of a brand compared to the big buck brands like Belvedere and Grey Goose and it’s certainly not pushed in the same aggressive way. Also, unlike many other premium brands, they do not feel the need to dwell in the department of over-enthusiastic storytelling involving myths and legend. Why not you ask? Because they have what many brands lack, is a complete lack of legend and tall tales replaced by a very simple and very real story about a real man behind the brand. A man who may, if he plays his cards right, be well on his way to becoming legend. What they have is company founder Tito Beveridge (yes, that is his real name! ), his vodka and the tale of how a simple man and his vodka became a success against all odds. Tito is, he and his people assure me, a real person and his story, it turns out, a true story. No overly clever storytelling, no lies or pretty pictures. Just a man and his vodka. And this, my friends, makes the whole premise behind Tito’s Handmade Vodka shockingly simple and all the more fascinating to this craft-booze-obsessed geek. The entire brand is built around a man and his desire to make the best possible vodka, not only in his home state of Texas, but in the entire world. It’s storytelling in its most simple and unadulterated form and that, more than anything, is what captured my attention about this particular brand of vodka: a supposed simplicity, an honesty and an attention to detail and to keeping it real despite an urge to expand and grow your brand. Coupled, of course, with a strong desire on the part of the founder and main protagonist of our story, Tito, to produce a vodka most extraordinary and smooth. In short, after reading the sales pitch, I wanted to know: Who is this Tito, and what is it that he does? Let’s find out together, shall we? Just who is this Tito? Bert “Tito” Beveridge (again, that really IS his name!) is a 50-some male born and raised in Austin Texas. A geologist by education and trade, he’s spend much of his life drilling into the oil business in such exotic places as Venezuela and Honduras before moving to Houston and entering into the mortgage business. In the early 1990’s, he started creating his own vodka infusions that he used for gifts. Great fun was had by all, and somehow along the way, Tito got the great idea that maybe he should try producing his own vodka… And the rest, as they say, is history… Right? A man with a mission? 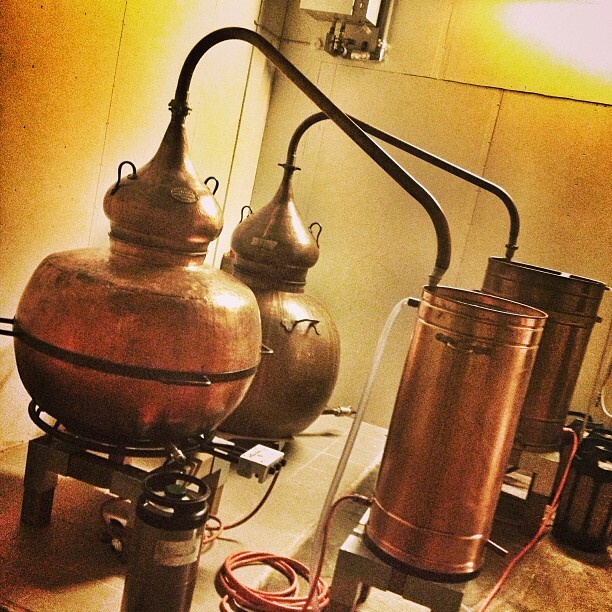 Birth of the American Craft Distillery movement! Well, not so fast young grasshopper… Before all of this does start to sound a little too simple and superficial, maybe we should mention that this Tito, while probably largely unknown outside the inner circles of the distiller community, isn’t just Mr. Anybody and that his story is all but simple. While the outline above does hold true, Mr. Beveridge – Tito to friends – aside from being a geologist and a vodka aficionado who decided to get into vodka-making, is actually a recipient of the Wine Enthusiast Spirit Brand / Distiller of the Year award for 2014 for his tireless work over the past two decades to help found and shape the American craft distillery movement. In a state not exactly known for it’s vodka production or consumption, mention the name Tito and many a Texan will be left with a smile on his face, they say. It appears that after a lot of hard work, Tito has managed to not only win over his home state, but also to get a firm grip on his home country not to mention, judging by the fact that bottles are now showing up on my door step, the world which would very well be next. For someone who started out with no knowledge and very little money, that’s a pretty impressive feat, especially considering that he has made these territorial claims with just one product in his lineup: a single vodka bearing his name! The story is almost too good to be true, but we’re getting a little ahead of ourselves again. As we have already hinted success didn’t come easy for Tito. 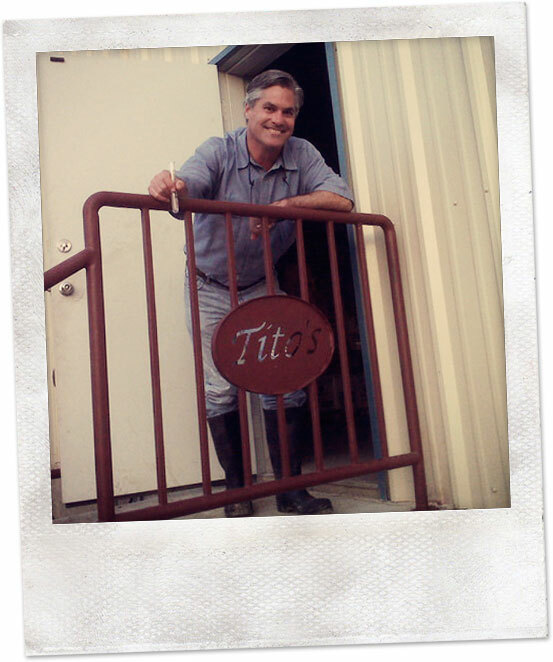 Setting out in the vodka business, Tito wasn’t even considering distilling his own vodka. His original idea was to simply sell his home-fashioned flavoured vodkas. However, in reality he found no market for his precious flavored vodka that he and his friends had come to enjoy. Customers, it turned out, wanted clean, crisp vodka that could be savored neat or used as a mixer without leaving any burn or nasty aftertaste. Tito’s winning recipe is distilled six times over, carefully filtered, diluted and tested to result in a clean, crisp spirit which has been priced well below the price point of most premium vodka brands. Now, given that the main differences between really good vodkas are usually to be found in brand, history and in price, it isn’t much of a wonder that the combination of a strong, local brand, a strong persona and a captivating story sold at a reasonable price has been a winning formula for Tito’s Handmade Vodka which has evolved from a small-scale craft production to a large-scale enterprise pushing out millions of bottles of vodka a year (still using the original recipe and production methods, they swear!). 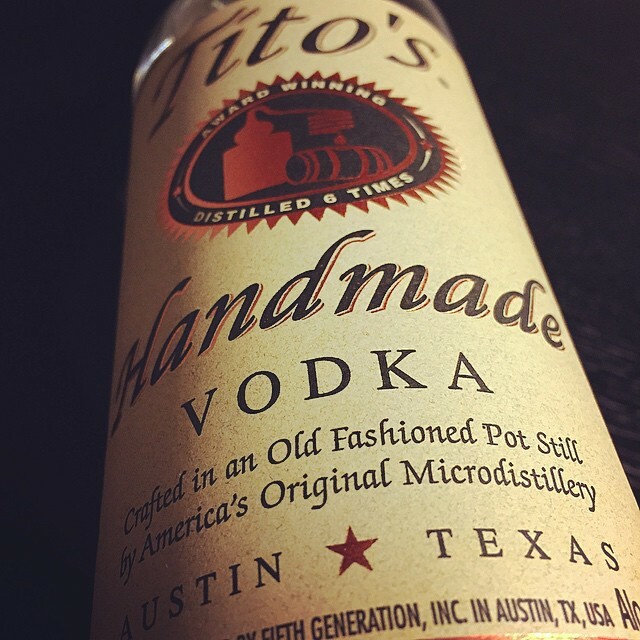 But what, then, does Tito’s World Famous Local Texan vodka look, smell and taste like? Can it live up to the hype? And is it even still a craft brand? This past weekend, I set out to give the product a thorough glance and, more importantly, a taste. Upon first glance, Tito’s Handmade Vodka appears to be keeping it real. Despite it’s supposed quality and it’s ever increasing reputation, the bottle is kept extremely simple and non-flashy, as is the label with its simple print and subtle logo. Despite it being churned out by the millions of bottles per year, you get the impression that not a whole lot has changed since the product was first crafted and bottled. It still has the look of a handmade craft product. The back label, in an equally non-flashy way, carries a bit of information about the philosophy behind the product and the process through which it was created. Here, too, you get the feeling that not much has changed and this, also, is a good thing. The first test of any vodka: How does it fare neat? Examining the content of the bottle it is – as expected – colorless and crystal clear. The smell, as could also be expected from an “odorless” spirit is almost non-existent: a trace of alcohol and a faint whiff of sweet corn. Tito’s, in a sense, has the look and smell that you would expect of a premium vodka, crystal clear and by no means off-putting on the nose. The taste? It’s mild, clean and, well, subtle as a good vodka should be. When sipped neat, which is how I like to first sample a vodka, it packs a bit of a punch from the alcohol, but it’s a comforting warning one, not a harsh, burning sensation. There’s a subtle sweetness, too, from the corn, the bottle assures me, not from added sugar. I’m inclined to believe the bottle, but whichever way it’s done, it’s an interesting additional touch for those of us living on the outskirts of the trans-European vodka belt and having grown up on completely dry vodka made from grain or potatoes. If I really scour the mind, I’m reasonably sure I’ve had smoother vodka experiences, but to be fair those did come at about twice the price of what Tito’s asking for his juice. And again, there’s absolutely nothing wrong perse with Tito’s approach: the combination of warming alcohol and slight sweetness from the corn, makes Tito’s an interesting sip or shot for those who in the immortal words of Billy Joel follow the rules and drink their vodka straight. For those not at all into vodka with a bit of character, an added ice cube or two would probably completely dull the impressions of the vodka, making it almost entirely odorless and tasteless as some feel a vodka should be. Or you could just jump right into the perhaps most obvious use for a vodka such as Tito’s: mixing! Looking for more vodka reviews: For some reason, I’ve ended up doing my fair share of vodka reviews over the years. If you’re thirsty for more, why not check out my review of my local micro-batch vodka, The Clumsy Bear? Or maybe my impressions on Baphomet, Mikkeller’s infamous 66.666% ABV goat’s skull vodka. 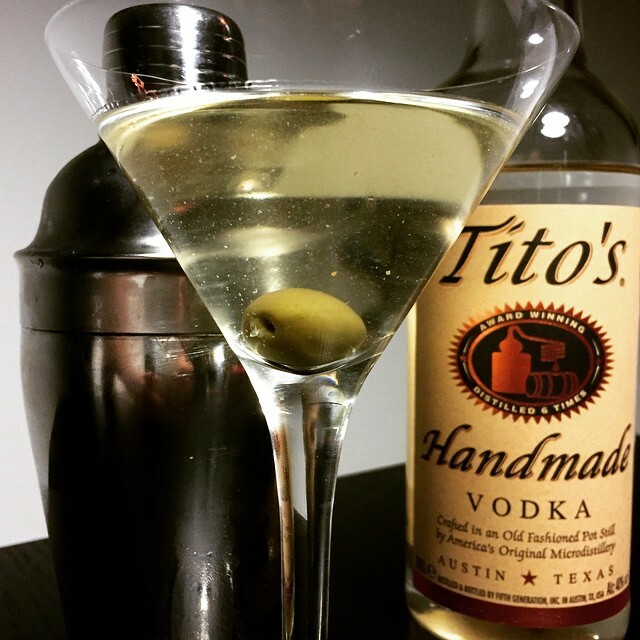 Tito’s Handmade Vodka: The perfect mixer? With a price tag in the $20 range, Tito’s is a pretty good bet for cocktails and mixing. It’s smooth enough as to not interfere too much with the taste of other ingredients and it’s cheap enough that you don’t feel horrible about breaking open a bottle with a couple of friends and mixing it up for a night of good fun and shenanigans. And Tito’s, apparently, want you to mix. Responsibly, I’m sure. Looking at their website, there’s an abundance of drink and infusion recipes available for every occasion and season. I, however, sort of went my own way and flirted with a few classics starting out with a high octane drink immortalized by my favorite Bond of all time, Sir Sean Connery. The iconic Vodka Martini: Stirred, not shaken! In playing around with a true American vodka, I couldn’t help but try my luck with one of the most iconic examples of product placement, the Vodka Martini, which helped spawn the massive success of another American vodka brand with a strangely Russian sounding name. With all due respect to Mr. Bond, I could, however, not bring myself to shake my spin on the Vodka Martini. It makes for a horribly cloudy mess of a drink. Aesthetics preferences aside, the relative smoothness and slight sweetness of Tito’s Handmade Vodka proved really successful in a high octane cocktail such as the vodka martini. The simple combination of 1 part Noily Prat to two parts Tito’s Handmade Vodka and a single olive made for a clean, crisp taste and none of the burn that you might otherwise get with an inferior brand of vodka – like the previous hinted at brand which shall not be named. I can only imagine that the same would hold true in other vodka-based cocktails. I resisted the urge to further explore this theory, though, and downgraded to a slightly less potent drink for my final test of Tito’s Handmade Vodka. For the last and final test, I reached for a true classic; the original, and probably most iconic American-born vodka drink known to man: the Moscow Mule – the drink that both sparked and helped fuel the American vodka revolution. It’s hard to believe today, but there was a time when vodka was a failing venture in the United States and even the owners of the mighty Smirnoff brand (oops, I went and named them) were struggling to make business. The saving pass for vodka in the United States came from a lucky combination of two things: An obvious warming in American-Russian relations in the 1940’s as a result of World War II, and a really clever bit of mixology/marketing joined effort between vodka producers and bartenders. Meet Tito’s and Crabbie’s. They’re such a cute couple! The Moscow Mule combined something very well known to American drinking culture, the Buck – a drink consisting of your spirit of choice, ginger beer and lime juice – with something new and exciting: vodka, the flavorless, crisp spirit of the new friend and ally in the east, Mother Russia. Add to that a name hinting to the mysterious origin of the spirit and a specialty copper cup in which to serve it and an instant classic was born. The Moscow Mule quickly became the drink of choice for an entire generation and the vodka fever, kickstarted by the Moscow Mule, spread like wildfire across the US in the 40’s and 50’s. American-Russian relations, as we all know, did not exactly improve during the period, but with vodka quickly rebranded as an all-American spirit and large-scale production starting up in the US, the love for the drink and the spirit has endured to this day. In this light, it is probably only fair that we try on America’s original craft vodka in America’s original vodka drink of choice, the Mule. Wouldn’t you say? 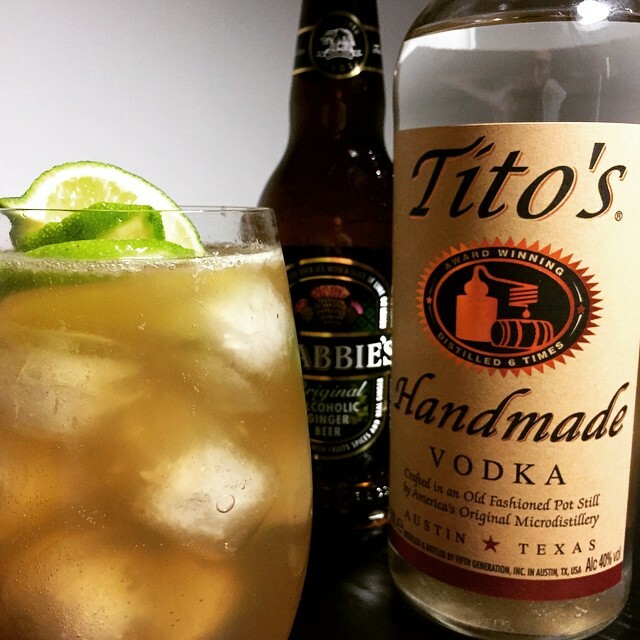 My version of the Mule borrows a bit from Scottish tradition as well, by blending Tito’s vodka with Scotland’s own Crabbie’s Alcoholic Ginger Beer and a splash of lime for a Moscow Mule with a bit of an extra kick. In this happy marriage, the vodka adds extra depth, more spice and an extra kick to the already warming ginger beer while the lime cuts through with a refreshing zing. It is, if you ask me, a match made in heaven, but they will knock you sideways in about an hour if you’re not careful. If you can’t get a hold of Crabbie’s or you want something a little less, uh, punchy. You can substitute a quality non-alcoholic ginger beer of your own choosing. More vodka fun: infusions! Looking for more interesting uses for a bottle of vodka? Why not try an infusion, that is a home-made flavoured vodka? For more info on the subject check out my posts DIY infused spirits and Strange infusions: Mojito-infused white rum. My take on The Moscow Mule: An American Classic made using America's Original Craft Vodka and Crabbie's Alcoholic Ginger Beer. 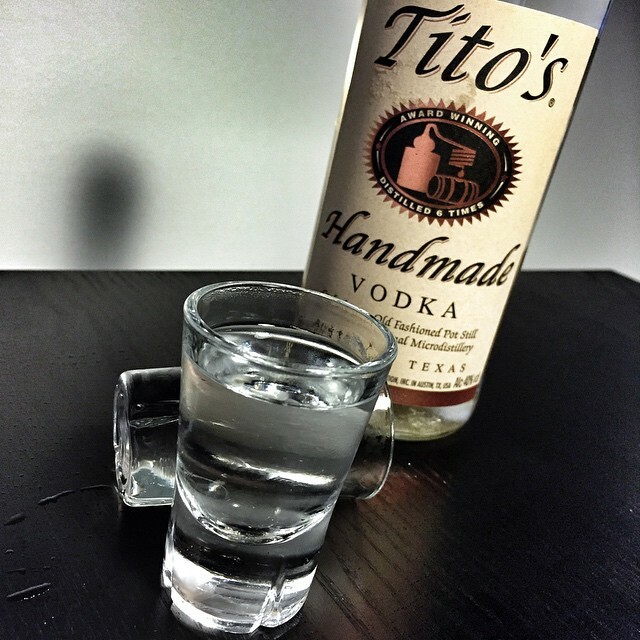 Tito’s Handmade Vodka: The verdict! In the course of some 20 years, Tito’s Handmade Vodka has gone from a small-scale DIY craft spirit to an almost staggeringly large production. This is by no means an unimpressive feat, but it does pose an interesting problem for a man and his vodka. Some will argue that it’s hard to define a product as a craft spirit made by hand when millions of bottles are produced and sold every year. Tito himself, though, is quite calm about the ruckus: It’s the same recipe and the same process, he says, only on a much larger scale and the quality control and attention to detail remains the same. In the opinion of this humble reviewer, the product still looks and feels like a hand-crafted spirit despite its international success. You still to this day get an honest and well-crafted package: a quality product at a reasonable price and no luxury brand overhead costs. Over the course of playing around with a bottle of Tito’s for a few fun-filled evenings I’ve found it to be easily on par with many luxury brands, and that at about half the price. It’s quite enjoyable neat if that’s your thing, but really shines when served chilled in mixed drinks where it blends beautifully with the mixers I threw at it to create a non-intrusive, warming (and intoxicating) backdrop. It’s honestly quite hard to find something terribly abusive or negative to say about Tito’s except maybe that it isn’t (yet?) available at my neighborhood watering well here in Denmark. And to be perfectly honest, I’m not quite sure why that is. After all, Danes do like their drink, they do like mixology, they do like fair prices and they do like a good story… Tito’s has all of those, so hey, here’s a bit of a plea to any Danish distributor that may be reading along: Go on, bring us Tito’s, I’m almost out! Find Tito’s: Tito’s is becoming increasingly available across the world. And above the world – they’re apparently now the sole vodka sold on United Airlines flights. If you’re looking to sample a bottle of Tito’s Vodka to call your own, consult their website to locate a near-by dealer. If. like me, you’re outside the US, try checking the website for a local distributor or simply go to your friendly neighborhood liquor store and ask for Tito’s! Hey, the demand’s gotta start somewhere, right? This entry was posted in Wine & Drink and tagged spirits. Perfect Spaghetti and Meatballs: A (Pseudo) Italian Classic?